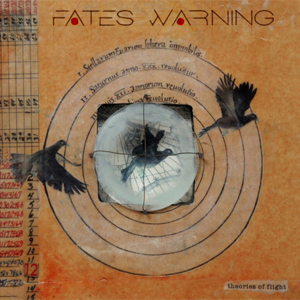 U.S. Progressive Metal pioneers FATES WARNING have announced a worldwide release date of July 1st, 2016 for their 12th studio album via InsideOutMusic. FATES WARNING guitarist and main composer Jim Matheos comments about the title and the artwork for the Theories Of Flight album as follows: "The working title for the album was The Ghosts Of Home and the song with that name was first called "Home Again". When I started searching for artwork I came across the piece that's now the cover and it was called Theories Of Flight. In fact, the title you see on the cover is part of the original art, not something we added. There's a loose theme running through a lot of the lyrics, and this developed organically and separately, where Ray and I are often writing about various uprooting, escapes....flights. So I was immediately drawn to that phrase as being a better description of what some of the songs are about." "Like Stars Our Eyes Have Seen"
Performed by the core line-up that returned to form with 2013's Darkness In A Different Light release (Guitarist Jim Matheos, vocalist Ray Alder, bassist Joey Vera, and drummer Bobby Jarzombek), Theories Of Flight was produced by Jim Matheos and mixed/mastered by Jens Bogren at Fascination Street Studios (OPETH, SYMPHONY X, HAKEN, etc.). In related live-news, FATES WARNING are about to perform two special 30th anniversary-shows for their classic Awaken The Guardian album.